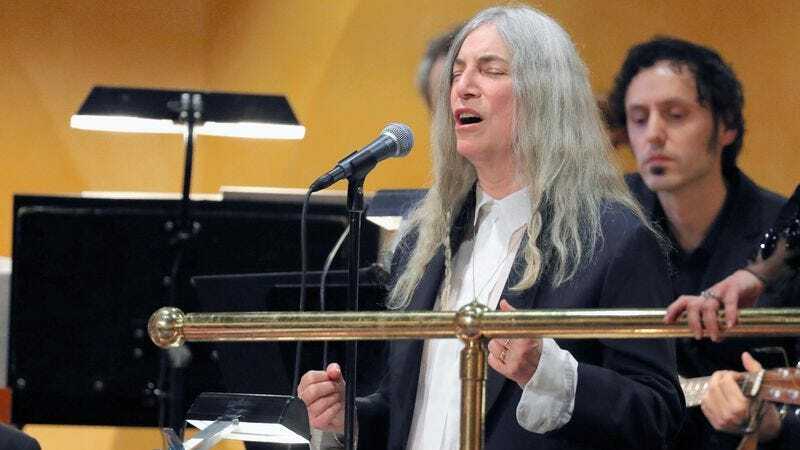 The Nobel Prize ceremony was held in Sweden over the weekend, and in honor of Bob Dylan being awarded the Nobel Prize For Literature, Patti Smith performed his song “A Hard Rain’s A-Gonna Fall” for the dignitaries and luminaries in attendance. Her rendition was very shaky at first, with Smith stopping the song early on so she could apologize for being nervous, but it became more and more powerful as she continued on and found her footing. It was a touching tribute to Dylan made even more touching by how much it clearly meant to Smith, with some of the audience members seemingly brought to tears by the end—as seen in the video, which is posted below. This week, Smith wrote a piece for The New Yorker about the experience, and it makes her emotional performance even more impactful than it already was. Titled “How Does It Feel” (a Dylan reference, naturally), the essay opens with a scene before Smith is born, with her father helping a taxi driver navigate Chicago’s Lake Shore Drive in the middle of a snowstorm while her mother is in labor. She’s using it to establish that she’s just as human as anyone else, and that’s something she’s been reflecting on in the lead-up to a big show she has in Chicago later this month for her 70th birthday. I found myself in an unanticipated situation, and had conflicting emotions. In his absence, was I qualified for this task? Would this displease Bob Dylan, whom I would never desire to displease? But, having committed myself and weighing everything, I chose to sing “A Hard Rain’s A-Gonna Fall,” a song I have loved since I was a teenager, and a favorite of my late husband. They showed appreciation for my very public struggle. They told me I did a good job. I wish I would have done better, I said. No, no, they replied, none of us wish that. For us, your performance seemed a metaphor for our own struggles. The conclusions Smith draws from the experience are as touching as the song itself, and you can read it all for yourself at this link.